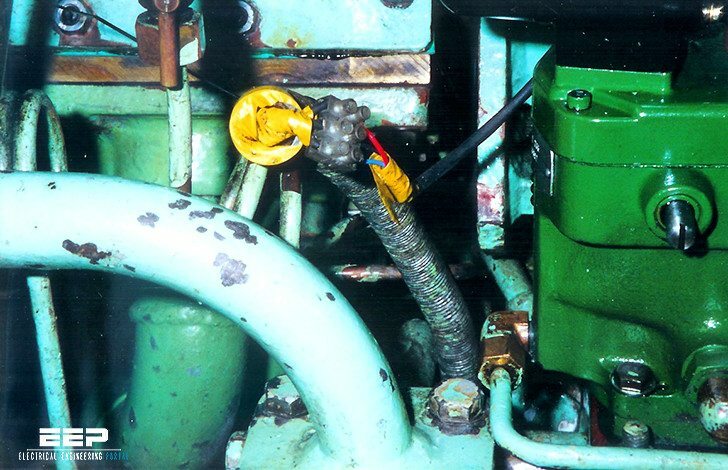 In explosive atmospheres shall exposed parts in general be earthed through an earth conductor in the supply cable. Exposed parts shall in addition be provided with an equipotential bonding connected to the main earth, this connection may be through the ﬁxing bolts or by separate earth conductor. Exposed parts in safe areas may in general be connected directly to the main earth. For practical reasons (inspection and maintenance) should direct earthing be limited to equipment in generators, transformers, switchboards and instrument rooms and to larger components. The user decide after practical /economical evaluations what shall be earthed through the supply cable. Each main switchboard and emergency switchboard shall be connected to the main earth by means of a separate main earth conductor. This is to be routed the shortest, most practical route from the main earth bar in the relevant switchboard to main earth. See Figure 1 below. The main earth conductor is to be connected to the structure by means of a separate connection to the main earth. This connection may be a steel bar or an earth boss welded to the main earth. There shall be at least one main earth connection to the switchboards in each switchroom. Precaution must be taken to ensure that the welded connection to the main earth has adequate cross section for the prospected maximum earth current. For instance it might be mentioned that a stainless steel bolt of diameter 10mm. welded to the main earth is not adequate for installations with direct by earthed neutral. The main earth connection shall be located such that it is not subject to corrosion or other damage, and such that it can easily be inspected. Generators and transformers shall be connected to the main earth. If the requirements of location of main earth connection cannot be complied with in the area concerned, the main earth conductor is to be connected to main earth in another area, or to the main earth bar in the supply switchboard, or in the switchboard supplied from the generator or transformer. See Figure 2 and Figure 3 below. Distribution boards and MCCs may be earthed directly to the main earth or to the main earthing bar in the supply switchboard (by means of an earth conductor or screen /armour in the supply cable or by means of a separate PE conductor). Smaller distribution boards for lighting and similar should preferably be earthed through the supply cable. See Figure 4 below.